According to the latest reports, Leeds United midfielder Kalvin Phillips is garnering interest from a host of Premier League clubs. Some heavyweight clubs like Arsenal, Tottenham Hotspur and Everton are said to be interested in the 22-year-old midfielder. Phillips is a product of United’s academy and is enjoying a good season in the first eleven. Marcelo Bielsa has trusted him in the defensive midfield role where he more often plays like a deep-lying playmaker. His ability on the ball and distribution skills sets him apart, and reports mention that the England manager Gareth Southgate is also monitoring his situation and development at Thorp Arch. Phillips has come leaps and bounds under Bielsa and is enjoying his time in his current deeper role. The manager has even backed the English midfielder even when he has made some glaring errors, and it is clear that the former Chile manager rates him highly. However, having watched Phillips week in and week out, we believe the player is still nowhere near good enough for a top-six Premier League club. Maybe the fact, he is young and has such unique sets of skills attracts the other clubs. England hasn’t usually seen a Sergio Busquets or Andrea Pirlo kind of playmakers in the deep role as it is generally accepted that defensive midfielders need to be industrious, tough tackling and hard working. Phillips reads the situations well defensively, but it’s his skill on the ball which makes him unique. When oppositions sit back, it allows the defensive midfielder to get on the ball without any pressure and pick out passes, and that is where Phillips is thriving. So one can understand why even Gareth Southgate is keeping an eye on him. However, all such rumours should make United more strong willed in keeping hold of their man as they are in between a season where they can achieve something special. Selling someone like Phillips in January is a big no-no and the way Bielsa has treated him so far, it is highly unlikely that he would be sold even if Premier League clubs come after him. Though one cannot say the same about the player as his head would turn thinking about playing for someone like Tottenham who are playing in the Champions League or Arsenal. However, there is still some time to go before he can think of making into the eleven of a Premier League club and it is likely that he would be on the fringes of the squad. To continue with his overall development, staying with Leeds United should be the right way to go and Marcelo Bielsa is the kind of manager who can improve him and help take the Englishman’s game to the next level. Arsenal Plotting A £25m Move For This Celtic Defender: A Wise Move For The Gunners? 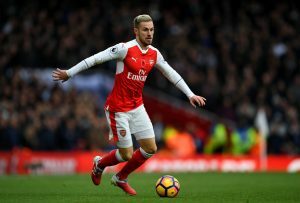 Arsenal Looking To Sign Serie A Striker In A Swap Deal With Ramsey: Right Choice From Emery? Swansea City Set To Lose Their Defensive Ace: 3 Possible Destinations For Him Including Arsenal!